Walking Sandals for Travel that are Actually Cute - Is it Possible? 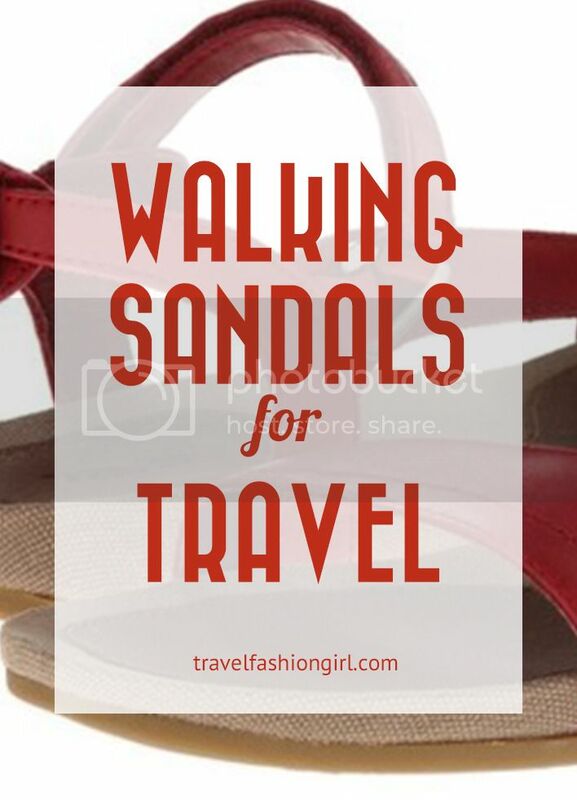 Home » FASHION » Walking Sandals for Travel that are Actually Cute – Is it Possible? Walking Sandals for Travel that are Actually Cute – Is it Possible? Walking sandals for travel have long been known for their comfort – NOT their style. However, it seems that some outdoor brands are finally catching on to the fact that travel and comfort does not need to equate to masculine (and well, downright fugly). Are female travelers finally going to get “travel gear” actually designed for women? While working on the current walking sandal shoe trend a few months ago, I came across some travel sandals that were actually not so unattractive. In fact, they were actually pretty cute. TEVA walking sandals in particular caught my eye. I shared my finding on TFG’s Facebook group earlier this summer and got a large amount of positive feedback from the readers – they loved these new styles! Ecco Shoes Review: Which of these Sandals are the Best? This iconic Universal Sandal goes all pretty and polished with a sleek leather rendition. Teva supports the outdoor athletic lifestyle and remains committed to innovation in outdoor performance footwear, the platforms which carry enthusiasts beyond the offices of the day-to-day and onto the rivers, trails, and canyons of the next adventure. Leather upper. Elastic gore on the straps offers an easy on and off without laces getting in the way. Soft leather footbed offers luxurious comfort. Canvas-wrapped midsole. Contoured EVA foam midsole provides lightweight comfort and support. Durabrasion Rubber outsole for ultimate traction. Wow – I’m surprised. They are actually pretty cute! While you’d never see me wearing these traditional and highly functional outdoor Teva walking sandals, the above shoes are styles I would actually wear! I originally bought them to test out on the cobblestone streets of Central America. Unfortunately, they were a size too small for me so they weren’t the most comfortable fit. I gave them to my mom and she was over the moon about their comfort! 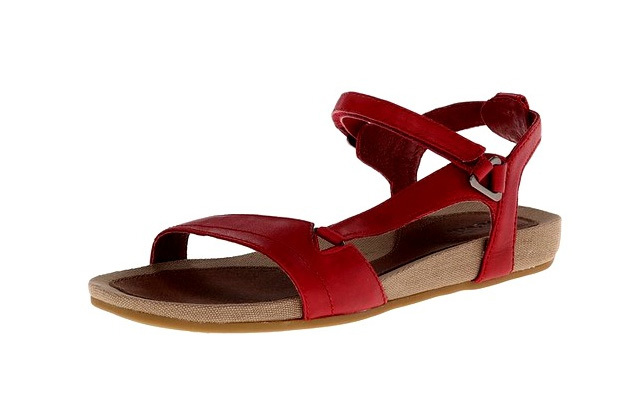 Her preferred style was the Teva Capri Universal Sandal! Read this post to find out what travel sandals ended up becoming my favorite! Stay tuned for the full review! What are your favorite walking sandals for travel? 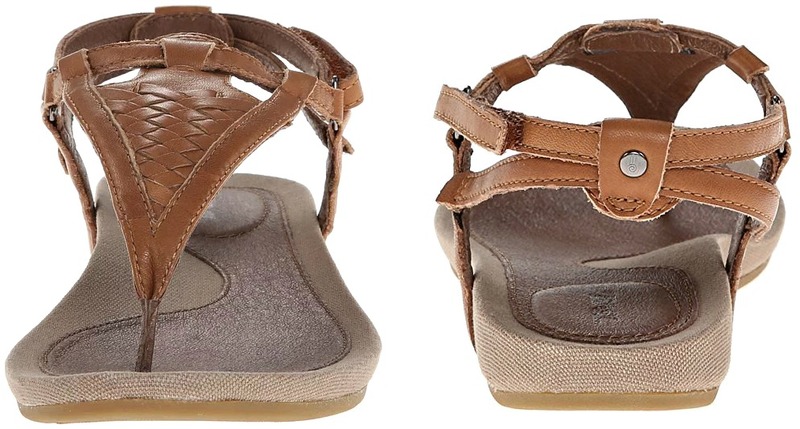 Hope you liked this post on these new cute walking sandals for travel. Please share it with your friends on Facebook, Twitter, and Pinterest. Thanks for reading! My biggest issue with finding sandals for travel is if they have the durability within wet conditions. Birkenstocks are great for the city but once wet they are ruined. The foot bed becomes hard and awful. Also they tend to be slippery in wet conditions. I have purchased a pair of Teva’s to take away with me (one whole year all around ASIA!) and have found that they are extremely comfortable and are non-slip while using at home. Hopefully they will be good in a monsoonal downpour. They could be better on looks but I’m happy with the style I have chosen, the Verra in BERING SEA! My goodness, what about the NAOT brand? Excellent travel sandals and shoes, quite a selection and many are cute! I would definitely try the Capri SW slide. I have had a pair of Ugg brand t-strap sandals very similar to them that have been on safari in Africa with me and on every beach vacation for 5 years. I have prominent bunion bones that bother me on long days and the best way to avoid that discomfort is to have this open style footwear. My Ugg sandals are worn out and I’m so glad to find out about these from Teva. I wore my teva sandals throughout Western Europe for three months. Extremely comfortable. I was recovering from Plantar Fasciitis and had no pain or reinjury despite all the walking. I would highly recommend them. I’m going in differents western countries, Europe in September and I’m wondering if these Teva will still be fashionable? Is ther any other sandals, you recommend? How did the Capri Slides fair for your travels? I’m considering purchasing for a trip to Athens and Rome in a few weeks! Hi Julie! Unfortunately they ended up being a size too small for me (and very uncomfortable because of that) so I gave them to my mom and she loved them! I love the soles on my Teva’s! So lightweight and comfy. However, I would really love to see them combine the “ look” of your favorite Naot sandals, with the Teva soles/ insoles. I suggested that to the company. So I guess we’ll have to see if they pay attention??? I took the SW slide sandals featured in this article to Europe in September and they were amazing. I had purchased a pair of Birkenstock gizeh sandals earlier in the summer to try out, and while they are cute and a definite wardrobe staple now, I knew that they would not be comfortable enough to wear for full days of sightseeing. I felt like I could feel the concrete on the sidewalks when I wore them. I ordered the tevas online (I couldn’t find them in any stores – they only sold the traditional teva styles) and they are so comfortable. They have much more cushion in the sole than birks, and while I thought they might rub, I didn’t get any blisters or raw spots. I would highly recommend them to anyone who is looking for a supportive, cushy, and stylish walking sandal. I got them in black and I’ve had numerous compliments. Hardly anyone believes me when I tell them they are tevas! Glad you liked them and they worked out for you 🙂 They really are cute! Time to replace them with cute and comfortable boots! I’m actually quite flabbergasted. I’ve always said that TEVA is the brand that I would never ever ever ever wear. But looking at the T-style pair, I’m actually very surprised. Still not a fan of the traditional sandal or the other one you mention here but still thanks for sharing! These look super cute and comfy, going to try this on my next trip! I just bought the Teva Capri Slide in black for our trip to Spain in a month! I’m hoping to wear them in before then. They came in the mail yesterday and I’m pretty happy with how they look on, though they do fit “snuggly” which should help with the foot/arch support. I think this is as good as it is going to good when it comes to fashionably comfortable! I’ll ask on TFG’s face brook group. https://www.facebook.com/TravelFashionGirl Thanks! I took these on a 3 week trip to Greece and Turkey in Spring and absolutely loved them. Although they are not quite as cute as the ones pictured above, they looked good with casual sundresses and capris. They were perfect for hiking through ruins and up Santorini’s volcano and spending long days on cobblestone streets. They were light and comfy, never left a blister, and could also be worn in the water- which was perfect for Greece’s rocky beaches. They did leave dye marks on my feet after getting wet, but it scrubbed off easily. This style comes in either polyester webbing or leather. Have you looked at Vionic by Orthaheel? I wore a pair of the Julie thong sandals last summer during a trip to Italy and my feet never hurt (neither did my back!) . They take a little getting used to because of the way the footbed is shaped, but you won’t believe how comfortable they are once you are accustomed to them.